Whether you hire a contractor or build your project yourself. Before you begin construction, lay out your lumber with the best-looking face exposed. Decide which pieces you want for visible areas, and which pieces for understructure. If heavy and wet, separate boards no more than 1/16” as some shrinkage will occur. 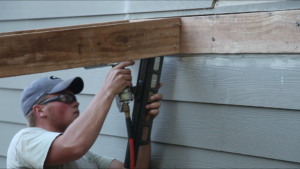 If light and dry, separate deck boards about 1/4” to allow for swelling. other intrusions into the wood with a suitable wood preservative product containing a minimum of 0.675% copper as oxine copper (copper-8 or copper-8-quinolinolate), 1% copper as copper naphthenate, or 2% zinc as zinc naphthenate. Orient embedded support columns so only treated ends are in ground contact. Cut ends should face upward. Fasteners should be hot-dipped galvanized or equally protected material meeting ASTM A 153. Connectors should be made from galvanized steel sheet conforming to ASTM A 653 class G185. Screws take longer to drive than nails, but hold more securely and will allow for easier removal if necessary. 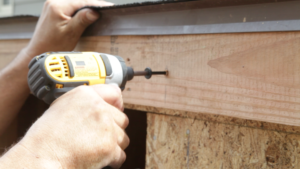 To reduce splitting, drill a pilot hole about three-quarters the diameter of the nail. For dense or brittle wood, grind sharpness from nails or blunt the points by striking them carefully with a hammer. Blunt nails cut through; sharp ones pry apart. Use enough nails: two nails across a 2 x 4 and three across a 2 x 6. Drive nails at a slight angle toward each other. 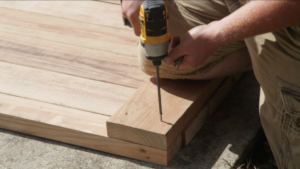 Use 3-1/4’’ nails (or 3” screws) on nominal two-inch decking. 3” nails (2-1/2” screws) are recommended for 5/4” decking. You can stain or paint Wolmanized® wood. You can also coat this wood with a water repellent; in fact, we highly recommend it. The best way to tackle these jobs depends on the wood you have, its exposure, and the coating you plan to use. For more information, choose the following scenario that best suits your situation. Are you using: Typical treated wood? Treated wood with built-in water repellent? Treated wood that is re-dried after treatment? When wood is pressure-treated, it is saturated with a liquid solution of preservative diluted in water. In a typical situation, the wood you buy is still somewhat damp. Paint — Do not apply paint until the wood is dry, both on the surface and internally. 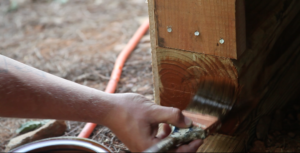 Otherwise, as the wood dries out, escaping moisture will cause blisters and poor adhesion of the paint. We recommend a six-month waiting period before applying paint. Once the wood is dry, the procedure for painting treated wood is no different from that for painting untreated wood. are the same as those for paint. Some formulations can be used immediately; others perform best when the wood is allowed to dry for a while. Follow the stain manufacturer’s instructions. Water Repellent — Most water repellent brands say that it is okay to apply a water repellent without delay, which is ideal timing. Follow the manufacturer’s instructions. To protect against moisture damage, some Wolmanized® Outdoor® wood is treated with water repellent as well as preservative. The water-repellent slows down the rate at which the wood absorbs and releases moisture. Paint & Stain — The recommendations are the same as above, but it may take longer for the wood to dry out. We recommend waiting 30 days before applying an oil-based product to treated wood, and waiting a year before using a water-based stain. Water Repellent — With built-in water repellent treated wood, you don’t need a water-repellent coating for 1-3 years (depending on the amount of water repellent present in the wood), but apply it every year or two thereafter. For optimum benefit, water-repellent coating can be applied initially, as soon as the surface of the wood is dry. In some areas, you can buy treated wood that is Kiln Dried After Treatment (KDAT) or Air Dried After Treatment (ADAT). In these processes, moisture is removed from the wood before shipment to a lumber dealer. KDAT or ADAT will be marked on the end tag stapled to each piece of wood. Paint, Stain, & Water Repellent — The moisture content of the wood is already in balance with atmospheric moisture levels, so coating can proceed immediately (unless wood contains built-in water repellent). No maintenance is needed to renew resistance to fungi and termites. Wolmanized® wood has a limited warranty against these organisms. However, protection is required to maintain the wood’s appearance against weather. Sun and rain cycles cause stresses in lumber and result in swelling, shrinking, warping, and cracking. To revitalize a dingy appearance caused by dirt and mildew, use deck brightener to clean wood.